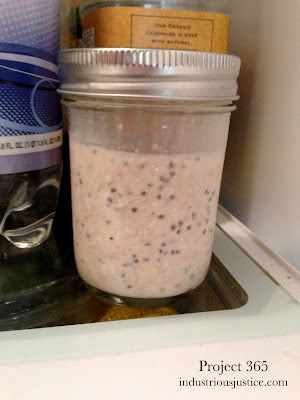 I recently tried an overnight oatmeal recipe and was pleasantly surprised that it works and it is really tasty. Perfect for during the work week. This was the simplest version -- 1/4 cup quick oats, 1/2 cup unsweetened almond milk, and 1 teaspoon chia seeds. Shake all that up in a jar and refrigerate overnight. In the morning, take out, microwave and add toppings.